Relax and enjoy the company of friends and family in a diverse garden filled with vibrant colors and enticing scents. With our dry California climate, watering restrictions, and high water rates, there has never been a better time to convert your landscape or lawn to drought-tolerant landscaping. California is home to an abundance of plants and landscaping materials to choose from, so your outdoor space will not only be low-maintenance and water-wise, but completely customized for your lifestyle. On average, a small 1,000 square foot lawn uses between 50,000 and 75,000 gallons of water per year. A landscape filled with native and climate adapted plants uses a fraction of that. We live in a dry climate that is not meant for growing turf grass or high water landscapes. Keeping them green requires an extraordinary amount of water. In California, we must do all we can to conserve our fresh water supplies. 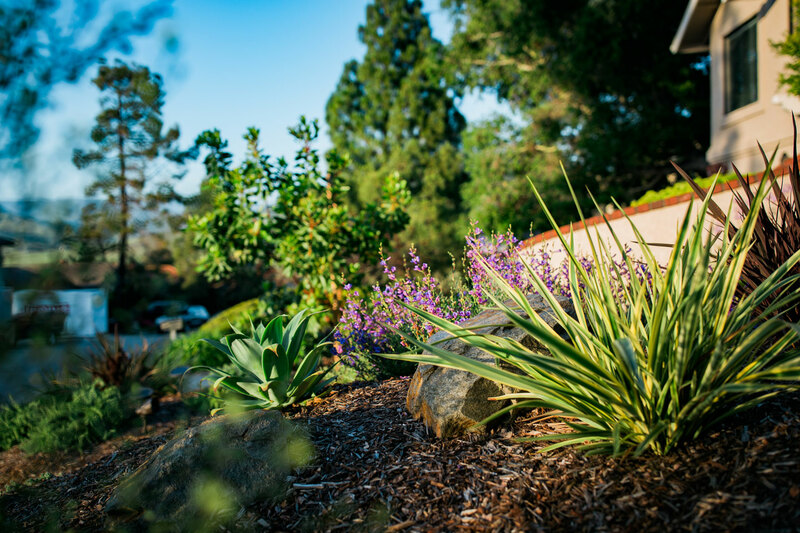 Replacing your lawn or high water use plants with drought-tolerant landscaping is a great place to start! Which aspects of your current landscaping are using the most water? In most cases this will be a lawn, but inefficient irrigation, high water use plants, and fountains also require a great deal of water. 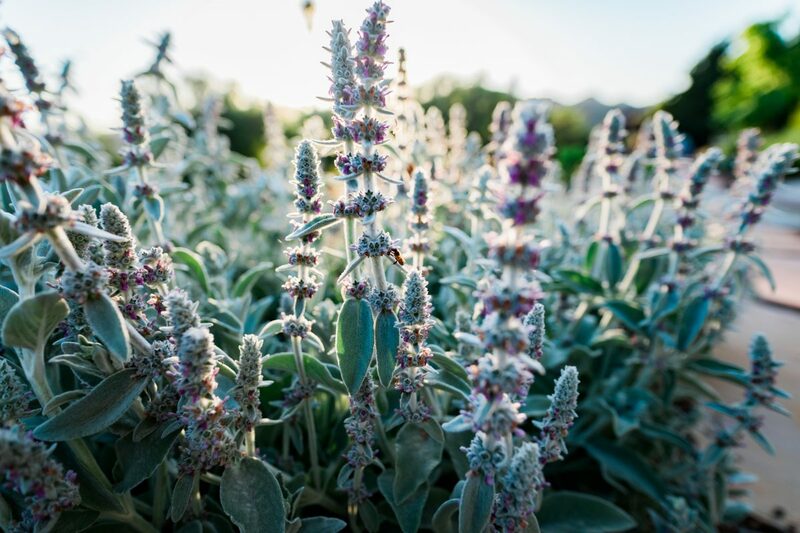 If you’re considering drought-tolerant landscaping, think about what you would like to change about your current landscaping to achieve less water usage. Lawns and water intensive plants can be replaced with climate appropriate plants and lawn alternatives. Irrigation systems can be retrofitted for maximum efficiency. Communicating your water issues and goals will help us customize the best drought-tolerant plan for your home. Do you still want a lawn? Need space for your kids to play or pets to run around? Luckily, there are several alternatives to traditional lawns that don’t need nearly as much water. The one we recommend most often is called Kurapia. It needs very little water and maintenance. In fact, you never need to mow it since it only grows around 2” tall! Native Carex is another great option and can either be left to grow tall for a meadow effect or mowed for a more traditional look. Do you want any patios, walkways, or other hardscapes? Hardscapes are a great addition to your drought-tolerant garden. They provide space for you to stroll through your native landscape or relax with friends and family. Outdoor kitchens, dining areas, pergolas, patio seating, and landscape walls can give your space a truly unique look and make it more fun to spend time outdoors. Have you considered rainwater catchment? Using rainwater is a great way to conserve! You can either collect it for later use in a rain barrel or build a rain garden that takes advantage of extra water runoff during the winter – making it more drought-resistant throughout the summer. Rain gardens can be a stunning landscape feature and are the perfect combination of both beauty and practicality. Do you have any favorite plants? There is an amazing array of beautiful choices for plants. We encourage you to start looking around and noting your favorites. We’re dedicating to ensuring your new landscaping is customized to your individual taste, so this can help to give us a good starting point to create the planting design for your unique landscape. Do you qualify for any water conservation rebates? Many municipalities (along with the state of California) offer rebates for converting your landscaping to a more drought-tolerant design. Rebates exist for irrigation retrofits, lawn removals, greywater systems, and rainwater harvesting. PACE Funding, a low-interest financing option, is also available for water conserving landscape projects. Wild Bloom is happy to help identify what options are available for you.